Bessie Ellen loves puffins so much that this year we have moved to start voyages earlier in Scotland just so we can see more of them during the breeding season. We will be visiting Canna, Lunga and Shiants to see both the puffin and guillemot in their millions, as they feed and nurture their young on these remote cliffs. Atlantic puffins, dubbed “sea parrots’, are small seabirds that belong to the Auk family and sport large, brightly-colored beaks on their substantially-sized heads. For most of the year, Atlantic puffins live on the open ocean, with a range spanning from the eastern coast of Canada and the northern United States to the western coast of Europe and northern Russia. Puffins are specially adapted to living on the open sea. Waterproof feathers allow them stay warm as they float at the ocean’s surface or swim underwater. Diving as deep as 60 m (200 ft.), they swim by flapping their wings as if flying through the water and use their feet to steer. There, they hunt herring, hake, capelin, and sand eels. Atlantic puffins are also excellent fliers. Flapping their wings at up to 400 beats per minute, puffins can reach speeds of 88 km/h (55mph). 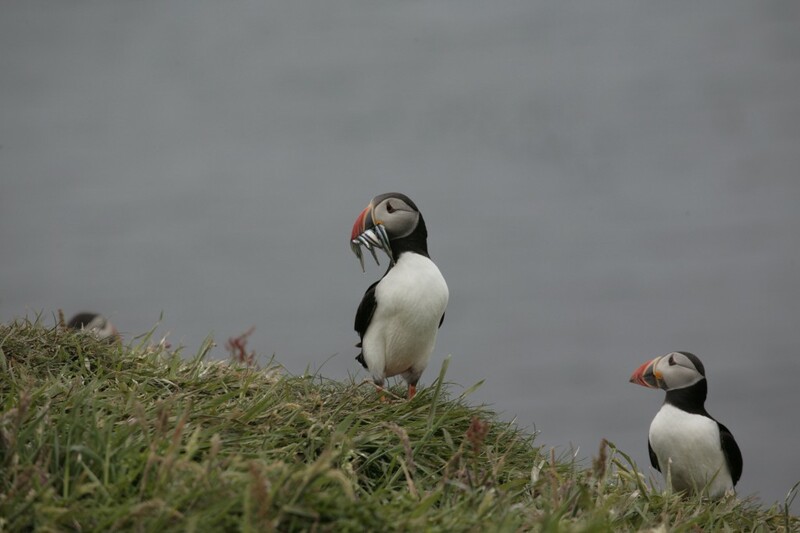 April to mid-August is breeding season for puffins. When a puffin is around 3-5 years old, it will choose a partner at sea to mate with for life. It is thought that the birds’ colorful bills and feet, which fade in the winter and brighten in the spring, help puffins assess potential mates. Puffins create burrows, about 90 cm (3 ft.), in rocky cliffs either in the soil or between rocks. Often, couples will return to the same burrow year after year. At the back of the burrow, they build a nest lined with grasses, seaweed, and feathers. After the female lays a single egg, both parents take turn incubating the egg for about 40 days. Once the chick hatches, the mother and father will take turns bringing it fish to eat several times a day. Atlantic puffins have the ability to carry several fish in their beaks at one time. They push the fish to the back of their mouth with their tongue, where ridges at the top of their bill secure the fish in place. This allows puffins to keep their mouth open to catch more fish without losing any in the process. In general, they can hold around 10 fish in their beak at once. With 6 million alive today, Atlantic puffins are not endangered. But some populations have been drastically reduced. Puffin colonies are threatened by overfishing, which causes a shortage of food for adults to feed their young. Greetings from Charlestown, Cornwall. We have been blown into the new year with gales and rain with still no sign of let up, but at least we are afloat and sheltered inside the lock gates here in port. Work starts today with maintenance to blocks and rigging as we move on into spring and the start of sailing in March. Two new crew join today, George and Freddie who sailed back from Denmark in December have signed up for the season to learn more traditional methods of sailing other than yachts. Both have good skipper experience from working in the Med for a charter company in Greece last season but I think they will experience a very different type of sailing aboard a traditional tall ship. First on the list will be servicing around 60 wooden blocks (Ash). For the last three years they have been aloft in sun, wind and rain and now need stripping down for greasing, revarnishing and checking for defects, i.e wearing on the cheeks. Although an easy task, it can be long and drawn out as the varnish will need good drying temperatures, not what we have at present. To reduce the chemical and polluting effects, we are using a Tung and linseed oil mix that penetrates the wood and provides a good shine, plus it is easy to repair when worn. Stockholm tar is added to colour the mix and help the waterproofing. Stainless pins are greased and new copper plates are set over the holes. I have a large collection of penny and ha’penny that are just perfect for this job and they have a sailing ship/ Brittannia on the coin face. Rope wise, each halyard and sheet will be end-for ended where possible. New splices turned in and served and parcelled in the traditional manner with spun yarn or tarred marlin. Using our strong ties with Denmark, many of our rigging products are sourced there. If you are looking for belay pins, hoops, blocks or other wooden items, can recommend H.J. Jacobsen for a fast and efficient service and not ridiculously priced! Now we have the time, i hope to update the blog weekly to give tips and advice to any boat owner also contemplating maintenance, and if you would like to get some hands on experience, then give us a call and come down to try traditional skills for yourself. Launching day arrives and today sees a beautiful contrast to yesterdays heavy rain, with warming sunshine, crisp air and a cobalt blue sky. Having spent three weeks on the slip at Ring Andersens’ shipyard Svendborg, our ship is ready to make a splash in her new livery of green anti-fouling and tarred topsides. 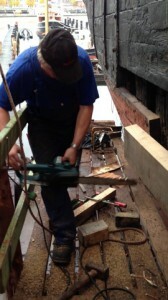 The carpenters have renewed three planks on starboard side. Why three? Due to the age of the pitch pine, now over 100 years old, it had become brittle, losing much of its resin and strength. The seams were also far too wide to caulk, and the trick of caulking in bandsaw blades was unthinkable this time. One of the planks held all the chain plates so the main shrouds were released and all the bolts driven out to allow access to plank and frames. Afloat again and its time to re-rig the shrouds by tensioning the lanyards through the deadeyes to the chain plates. So it’s out with the handy billy and some applied muscle with accompanying grunts. The important thing is to get the tension just right. Not too loose or too tight and of course even on both sides. 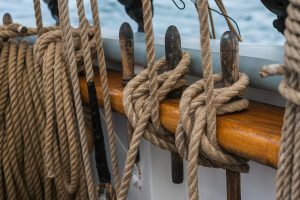 Once set up with the mast straight, a racking seizing is laid onto the lanyard to hold the rope from slipping then finished with a cowlick hitch. Today we work with a modern spun yarn instead of the more traditional tarred marlin, it lasts longer and doesn’t break so easy. Luckily for us we have the help of Oda who has recently come from the training ship Georg Stage who has a keen interest in traditional boats and rigging. Niels, a long standing crew member has also arrived from Copenhagen to give a hand h ere and there. So while we are busy down in the yard, Pete’s work is to pull a crew together for the voyage home in a few weeks time. The plan is through Kiel canal, past Cuxhaven then down towards Dover before we turn west to Cornwall and our winter berth, Charlestown harbour. On our arrival in Charlestown in early December we will be organizing a series of events over the winter months, these will include open boat days, work shops highlighting traditional skills, presentations, lunches and possibly public Christmas dinners. Preparing for sea. Our voyage crew are ashore on Tresco being given a guided tour by Will Wagstaff. With the weather we have been having, this place is better than the Carribbean, the sand so white and azure sea. Yesterday we took a picnic lunch on St Mary’s provided by our chef,Pete. Homemade quiche with chilled white wine, salmon and potato salad all went down surprisingly well. One of our old Scillonian crew made a fabulous birthday cake for one guest so after all that food we slept on the sand with the birds singing in the spring sun. Tonight will be a different story. Forecast E’ly 5-6. I suspect a long voyage back to fowey but well worth it. Bessie Ellen will sail with double reefed mizzen, full main and three heads’ls, hoping to make 6.5kts, arriving Fowey Sunday morning. I think nothing can be better than dropping anchor in a sheltered bay after a good stiff breeze. Today, St Mawes is that bay after a very fast passage from Fowey. With 3 reefs in the main and two headsails, our top speed was 8.3 kts and only three crew on board to enjoy it. We roared passed the Dodman with numerous white horses scattered across St Austell bay. Round the headland there was a little more shelter but still a quartering wind to push us along. Finally, sails down underneath St Anthony’s and a quiet arrival to the anchorage. Now, wheres the tea! If you would like to come and try tall ship sailing, we are in Falmouth until 3rd June offering days out in the river, or shorter voyages at 4 hrs. See Classic Sailing for more details. This weekend, come and join in the maritime fun in two of our finest West Country ports. On Friday, Bessie Ellen will lead the fleet on the opening day of the Fal River fest from King Harry ferry to the ancient port of Falmouth. This will be the start of a whole week of events in the estuary, including the pilot cutter review hosted and sponsored by Classic Sailing of St Mawes. Bessie Ellen will be sailing daily so come to Events square by the Maritime museum to book your place on board. Early Saturday morning, Bessie Ellen arrives at the Barbican, Plymouth, her home port and where she was built over 100 years ago to provide the backdrop for the Pirate festival. This magical weekend full of fun and piratical antics will include an on board pirate themed cookery demonstration by our old chef, Sam Bagshawe. On the menu will include Pirate juice, Pirate fish and a Pirate cake. Of course full costume attire will be worn. Open ship all day will give an insight into ships of the past and fun for all the family. This is just a post to make sure the Ship’s Log is working. It seems it is! Hurrah.